The History Factory equips leading organizations to discover, access and use what is already uniquely theirs: heritage. 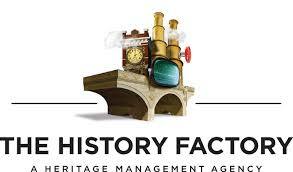 When someone asks what we do at The History Factory, it’s tempting to talk about our award-winning creative work such as corporate history books or company exhibits, or our comprehensive archival services or our consulting work – especially our unparalleled corporate anniversary experience. But that’s just part of the story. We blend storytelling, technology, design, communications and archival and historical expertise to create and orchestrate customized programs for clients.